The Center for Disease Control (CDC) estimates that 1/3 of adults (more than 84 million US adults) have prediabetes, and of these individuals, nearly 90% are unaware of their condition. When blood glucose (sugar) levels are higher than normal, one is considered to have prediabetes. These individuals are at a greater risk of developing type 2 diabetes, stroke and heart disease. Research shows, without a lifestyle change, prediabetes can lead to type 2 diabetes within 5 years. Type 2 diabetes can also lead to serious conditions such as kidney disease, blindness, heart attack, stroke, and nerve damage. Type 2 diabetes accounts for 30.3 million people in the United States, and 1 out of 4 individuals do not even know they have it. In Wisconsin, approximately 356,000 adults and 6,500 children/adolescents have been diagnosed with diabetes. Could you be the one with prediabetes or diabetes? Along with the health issues that are related to having diabetes, there is a substantial economic impact on individuals and their families. In March 2018, the American Diabetes Association released new research estimating the total costs of diagnosed diabetes has skyrocketed upwards of $327 billion; which is up from $245 billion in 2012. For someone diagnosed with diabetes, medical expenses each year average around $16,750. In Wisconsin, diabetes has an estimated cost of $5.5 billion annually in health care cost and loss of productivity. PREVENTION is Key…Make a Change Today! There are many steps one can take to prevent or delay the onset of type 2 diabetes. Lifestyle modifications are key components to preventing the onset of type 2 diabetes, which include healthy eating and physical activity as the cornerstones. Setting small, realistic goals will help create permanent lifestyle changes. These changes aren’t easy; it does take planning, time and a commitment to improving your health. By committing to healthy eating and being physically active, weight loss can be achieved. Studies have shown even a modest weight loss of 5% to 10% of body weight can improve health, including reduction of blood sugar. For example, a 200-pound person would need to lose 10-20 pounds to reduce blood sugar levels. 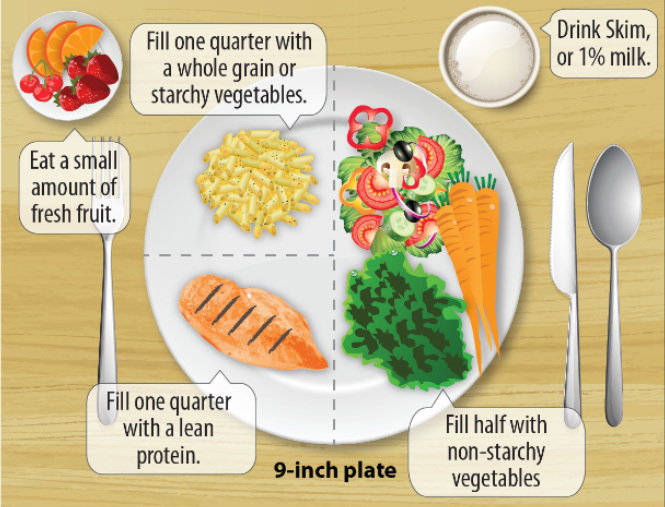 Eat smaller portions to help reduce weight. Choose a smaller 9-inch plate. Reduce portions of foods high in carbohydrates. Eliminate all sugary beverages, such as juice, regular soda, energy drinks. Plan your meals and snacks ahead of time to stay on track. Eat a protein-rich breakfast daily. Do not skip meals. This will prevent overeating later in the day. Avoid eating in front of the tv, computer or phone. Eat slowly to allow your body to feel full. Schedule an appointment with a dietitian for nutrition education and meal planning. Aim for 150 minutes of moderate to vigorous physical activity weekly. Go for a brisk walk/jog for 30 minutes, 5 days a week. If you don’t have a solid 30 minutes, break into 3–10 minutes sessions. Join a gym. Get a trainer. Find support—work out with a coworker/friend/family. Try lifting weights, doing sit-ups/push-ups and using resistance bands. Get in your steps, invest in a step tracker, aim for 10,000 steps daily. Park farther away in the parking lot, take the stairs instead of the elevator. Take action today to prevent type 2 diabetes. Each small step you take today will make for a healthier you in the future. This is not a short-term fix; this needs to be a permanent lifestyle change. The lifestyle changes implemented today will save you both time and money. Don’t Delay, Start Today! 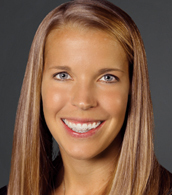 Ms. Segerstrom sees patients in Eau Claire.